The people you meet on the phone, at boat shows and through emails, work at Offshore Sailing School headquarters in Ft. Myers, Florida. They are all avid sailors and boaters, have taken or about to take one or more Offshore Sailing School courses, and are very knowledgeable about our locations. Our Sales Team is inspired by Beth Oliver, Director of Marketing on our Executive Team. Wendy moved to Florida in 2007 from Milwaukee with her husband. She studied business at Eau Claire University in Wisconsin and has worked in Sales and Administration with GE Medical and Verizon. An entrepreneur, she has owned and operated two small business in Milwaukee and Cape Coral, FL. Growing up near Lake Michigan Wendy enjoyed sailing in the summers with her husband and three daughters. Her hobbies include fishing, boating, and traveling. Her direct line is 239-985-7509; email wendy.bishop@OffshoreSailing.com. Dawn’s story started when a sailor fell in love with a local girl as his boat was docked at her Mediterranean island. Growing up on the Pacific in Southern California, and spending summers in the Mediterranean, she was always in or on the water – body boarding, fishing or sailing. It was a huge life change when she took a promotion in Colorado. Her passion has always been focusing on the customer; from starting a successful private label brand to helping restaurants be profitable. As a former All-American Soccer Player at the University of San Diego, she found time along the way to coach professionally and play in the WPSL. But more significantly, on the field is where she met her incredible husband! Dawn and her family recently relocated to Southwest Florida to be close to family. Being back on the water and joining Offshore Sailing’s amazing sales team has been a dream come true for this California girl. Her direct line is 239-985-7524; email Dawn@OffshoreSailing.com. Michael, a graduate of the University of Wisconsin – Milwaukee, grew up in true Midwestern fashion on a farm in rural Wisconsin surrounded by corn fields, white tailed deer and thousands of ducks and geese. As a true Wisconsinite, Michael enjoyed hunting, fishing, snowboarding, football and family. Michael was introduced to the sailing lifestyle at a young age since his father owned a sailboat brokerage business. After graduating college in 2015, Michael headed to the southwest coast of Florida where he used to vacation as a young boy, and first fell in love with the water. Before joining Offshore Sailing School’s sales team, Michael was the marketing director for one of South Florida’s largest powersports dealers. He was also a staff writer for two local Southwest Florida publications, and a senior sales executive for a technology firm in Fort Myers. Michael has a warm and inviting disposition and customer focused philosophy. His hobbies include spear fishing, traveling, cooking, fitness, biking, diving, sailing and anything that involves the ocean. 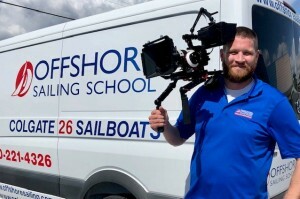 “Working at Offshore, I’ve had the pleasure of enriching the lives of our great students and couldn’t be happier to be part of such an amazing team.” His direct line is (239) 985-7514; email Michael@OffshoreSailing.com. When her two sons left the nest, Diana elected started sailing on Highlanders in Indianapolis, IN. In 1997 her General Motors job moved to Detroit where she raced on a C&C35, J120s and NA40s at Bayview Yacht Club – one season as skipper and seven seasons as crew chief. She has sailed “her favorite boat,” the Colgate 26, since its introduction in 1997 and has taken every course Offshore Sailing has to offer. During her four years as President of the National Women’s Sailing Association, she taught at Women’s Conferences, led Caribbean flotillas and Chesapeake schooner sailing programs. Diana joined Offshore in 2004. 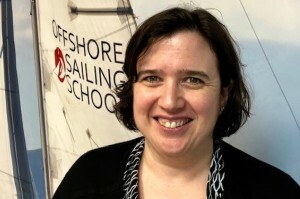 Her direct line is 239-985-7506; email DianaSmith@OffshoreSailing.com. Ryan graduated from Full Sail University in Orlando, Florida, with a Bachelor of Science Degree in Film Production. Originally from the “Mitten” State of Michigan, Ryan’s passion in life is video production. He grew up filming action sports and turned a hobby into a profession. 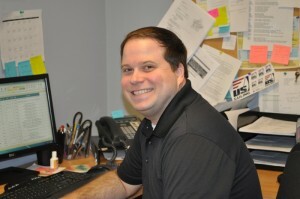 Before joining Offshore Sailing School, Ryan worked on productions in Atlanta, Georgia, and throughout Florida. If you ask him when he started working in the film industry, he’ll tell you he hasn’t worked a day in the past six years. Ryan currently lives in Ft. Myers, Florida, and is responsible for all of Offshore Sailing School’s in-house video production, photographic needs, post-production and distribution to increase awareness and engagement in Offshore’s sailing and power boating courses, flotilla trips, corporate team building, racing programs, and special events. Ryan’s direct line is 239-985-7525, email ryan@offshoresailing.com. Josh moved to Florida from Milwaukee where he received a Bachelor’s Degree in History and Secondary Education from Marquette University. In 2011 he received a Bachelor of Science Degree in Interdisciplinary Studies from Hodges University. Before joining Offshore he worked as production specialist for MSX International, office assistant for Hunter Robert’s Homes, and Target. He lives in Bonita Springs, FL and is responsible for managing resource inventory and our booking system, while assisting the Director of Operations in whatever it takes to make branch operations run smoothly. His direct line is 239-985-7500, email Josh@OffshoreSailing.com. Cheryl is a Navy daughter and a Navy wife. She grew up on Maryland’s Eastern Shore and Southeast Virginia and has always loved being around waterways. When her husband left the Navy, they moved to the Roanoke Valley and they would have to plan trips to visit friends and family in order to get back to the water. When Cheryl’s husband accepted a job with a major commercial shipping line, it allowed them to move wherever they wished, and they happily settled in Southwest Florida, where family and Cheryl’s water awaited. Cheryl enjoys spending time on her lanai, enjoying the views and reading books. Her direct line is 239-985-7530, email Cheryl@OffshoreSailing.com. Gabrielle was born and raised in Ft. Myers, Florida. She attends Florida Gulf Coast University and is pursuing a degree in Communications with a minor in Spanish. She doesn’t have a specific career in mind yet, but wants to travel to Spain and other countries to take classes abroad before she graduates. 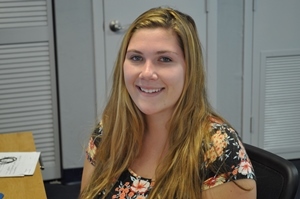 Her direct line is 239-985-7507; email Gabrielle@OffshoreSailing.com.